Paul O’Connor, who’s putting his summer break from teaching aspiring journalists to good use, reviews a book about the Doolittle Raiders, who struck back against the Japanese just months after Pearl Harbor. 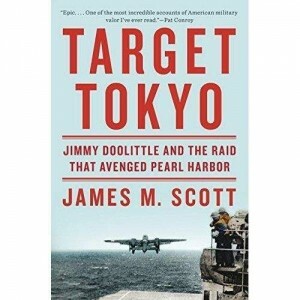 TARGET TOKYO: JIMMY DOOLITTLE AND THE RAID THAT AVENGED PEARL HARBOR. By James M. Scott. Read by L.J. Ganser. Audible Studios. $34.95. 20 hours, 3 minutes. Also available in hardback from W.W. Norton. 648 pages. $34.95. The U.S. Army Air Corps raid on Tokyo on April 18, 1942, occupies a curious position in American military history. Although the 16 B-25s under the command of Lt. Col. Jimmy Doolittle did little damage to the Japanese military, it ranks at the top of our military mythology. That curiosity can be explained by the dual nature of the raid, and, therefore, of the discussions about it that persist. First, we have a story of adventure and brave young men. Second, we have a debate of military impact and repercussions. In terms of military improbability and pure daring, the raid was every bit the equal of Japan’s bombing of Pearl Harbor less than five months previously. The Japanese felt inviolable in a homeland that foreigners had not attacked in centuries, in this case especially so considering the damage their sneak attack had perpetrated against the American Pacific fleet on the morning of December 7 and the vast ocean that separated them from the closest American air bases. Just for those reasons, U.S. military leaders gambled that they could surprise their enemy. They’d solve the distance problem by sailing the carrier U.S.S. Hornet within 500 miles of Japan. They wouldn’t attack with carrier aircraft, however. Those had neither the range nor the ordinance capacity for such a raid. Instead, they would launch medium-range, land-based B-25s off the Hornet, an untested idea. The B-25s would bomb Tokyo and nearby cities on the island of Honshu, and then fly to China, where they could land on airbases controlled by our Chinese allies. Mining both flight logs and Japanese post-raid documents, Scott carries us along as each of the 16 planes’ attack detailing where each of their four bombs was dropped and the impact that each had. It is remarkable reporting. By the end of the raid, however, the reader is only half done. There are hours of listening/reading ahead to learn of the fate of these 80 men and to measure the morale boost the raid had on the American people. The adventure is every bit as exciting as we can imagine. But when lives and precious military assets are involved, a question follows: What did the raid accomplish? Little in terms of military damage to Japan. Civilian targets were hit by mistake, and dozens of civilians died. But no important factories were destroyed, nor ships sunk, nor armies obliterated. And there were horrendous consequences in China. Once Japanese leaders determined that there had been Chinese complicity in the raid and in the escape of some fliers, Japanese forces launched a bestial attack on the civilian population, likely murdering a quarter million innocent people. Scott recounts it all in chapters that are extremely difficult to read. Japan’s fury did not stop there. To avenge the raid, and to ensure it could not occur again, Japanese military leaders pursued another attack directly due east, this time hoping to take Midway Island and lure the remaining American fleet, especially American carriers, into a battle they were certain to lose. History turned unexpectedly, however. The Battle of Midway was a decisive American victory and the turning point in the Pacific theater. If the Doolittle attack is judged by military historians to have been impetus for the Japanese venture toward Midway, then the raid suddenly gains enormous military significance. While Scott provides some historical evidence that the raid did lead to the Japanese move toward Midway, he does not fully answer that in this book. Maybe it’s a topic better covered in histories of Midway. This entry was posted in Audio Books, History, Military History and tagged Audio Books, Doolittle Raiders, James M. Scott, military-history. Bookmark the permalink.